Summoner Wars is the exciting card game of fantastic battlefield combat that puts you in the grandiose role of a Summoner. Strategy shapes the composition of each deck of cards and how they are used. Tactics determine the effectiveness of those cards in battle. UPDATE 3: Thanks to Bladgrim, the second summoner phoenix elves deck has been fixed, and the turn order is now default in the notepad (don't know how I didn't think of that before). I did this almost a minute after update 2, so there is no update 2 save file. Sorry for not doing these things sooner guys. UPDATE 2: Version 1.3 allows you to select the deck to be sideways, which means that when you alt-zoom it views the cards properly. For those of you who use the save as-is, I have re-imported all decks using this option. I used the same images so you won't have to re-download. It does have the issue of resetting the orientation if you re-stack them, however. UPDATE: Due to version 1.2 being released (which allows non-square boards), I have re-uploaded the save with a better looking board. The cards still fit snugly into the rectangles and all is well, it just looks better and has no watermark. Also, loading the game should be MUCH easier with the on-disk loading, even though you still have to download all of the cards the first time. Make sure to download the one that says "Version 1.1" in the bottom right (sorry I didn't change the filename). 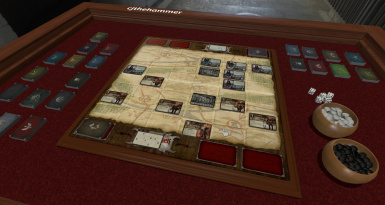 This is my version of Summoner Wars by Plaid Hat Games for Tabletop Simulator. puts you in the grandiose role of a Summoner. Strategy shapes the composition of each deck of cards and how they are used. Tactics determine the effectiveness of those cards in battle. Call walls of stone to protect you in combat and serve as magic portals for you to summon your warriors. Call your forces forth and send them in a surging wave against your enemy. Cast spells that bolster your forces and cut down those who would oppose you. This contains every basic faction deck and second summoner decks. This means that these are the exact ready to play decks that come from the official products. If you wish to make custom decks, then you would have to take it upon yourself to download the card art and put it into a deck. Basic faction decks are on the right and the second summoner decks are on the left. I would recommend using the strip in front of your hand for dice rolls, or you can move unused decks out of the way. 1. The Go pieces are for wound markers. I use the blacks to denote 1 wound and whites to denote 3, but you can obviously switch those if you want. 2. The decks are ordered to allow for easy setup. The end of the setup cards is marked by the faction's Summoner card, meaning you draw cards until you see the Summoner, at which point you have all proper setup cards from your deck. You still need to shuffle the rest of the deck, however. 3. Factions that have special walls (alternate Tundra Orcs and Swamp Orcs) are also ordered with the setup cards, all you need to do is set them into a separate pile (check the rules for more information). 4. The setup reference card does not have a back. This is because I felt it would not be practical to create a separate deck just for the reference card, and due to a card minimum of 2 in a deck would cause unneeded cards. Therefore, you do not have a turn order or event card reference sheet. 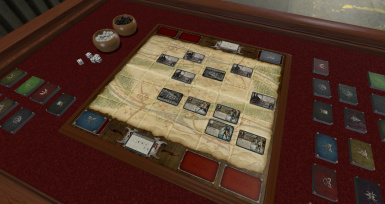 The turn order can be memorized or checked on the rulebook, and it is also in the notepad. 5. Most decks were not made using AndrewM's deck builder, this means they are not perfect (you may see some white on the edge of some cards), I may perhaps go back and redo every one using the deck builder, but for now this is not a priority. 6. Cards have varying image quality, (due to lack of quality standardization from the source, and the fact I had to resize them for the template) but are all legible. You can now import decks sideways so alt-zoom should work fine, although in some instances it stops working, which is weird. 7. All walls are the same because I couldn't find faction specific walls, but you can only have your own walls on your side so this shouldn't matter except for flavor. I was able to find the Mercenaries wall, though, so they have their own. 9. 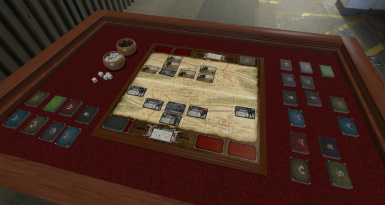 No 4 player mode because you can only have one board. 10. Each faction has it's own hidden card (the card that you see when it's in another player's hand). 11. The second summoner decks tend to be more complex, so I wouldn't recommend using them if you are new or learning. P.S. If you want a version where you have no cards (so it's easier to load, and you only have to import the decks you are going to use) let me know or you can make one yourself. P.S.S. Sorry OCD people, the card rows aren't perfect, I know.